Vintage black-and-white films from the archives of England, Germany, Italy, and the US put you in the cockpit over the front lines and the South Pacific. Three programs spotlight the great fighting aces, the planes that vied for supremacy, and the battles that filled the skies. Includes interviews with aces from both sides of the conflict and live-action footage of Spitfires and Mustangs, Lightnings and Corsairs, Messerschmitts and Thunderbolts. 8 hrs, 3 DVDs, B&W. From the fighter pilots of the Spitfires who won the Battle of Britain and the U.S. Army Corps pilots in their Mustangs that escorted the bomber assaults on Germany's heartland, to the Lightnings and Corsairs which dominated the Pacific, this program looks at all major United States, British, and Russian combat fighters. Germany, Italy, and Japan developed some of the most advanced and effective fighters of their time. To protect their rapidly moving troops, and later to defend against devastating Allied bombing, the Germans and Japanese deployed superb fighters, such as the ME-109, FW-190, and the Zero for supremacy of the skies. These and many others, including earlier operational jets and rocket fighters, are seen in unique live-action footage. This film was made with the cooperation of Britain's Imperial War Museum and the United States National Archives. World War II raised the stakes as the skies over Germany and the South Pacific raged with deadly air combat. 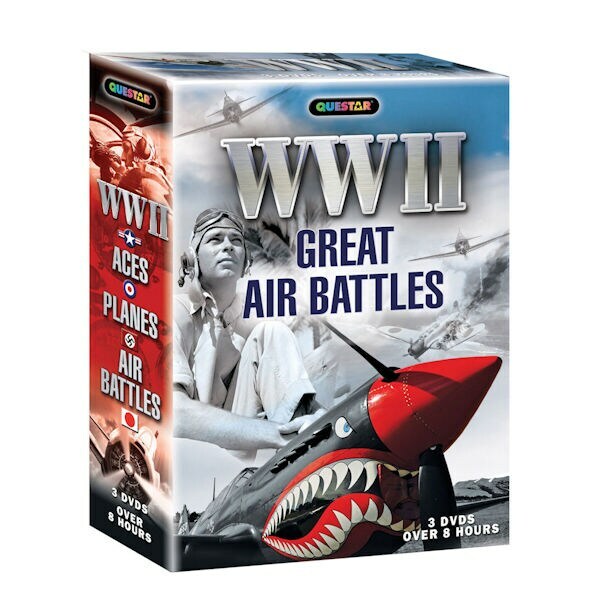 Great air battles thundered as the Axis and Allies waged a menacing race of arms. Faster and more lethal planes from the Nazi Focke-Wulf 190 and Messerschmitt 109G to the Allies P47 Thunderbolt and P51 Mustang and Spitfire MK24 protected the around-the-clock bombers. The air battles of the Pacific had been going the Allies way, but the Japanese Kamikazes were the killers that left the U.S. Navy reeling. The final air battles culminated with the first combat jet fighters and the B29 Superfortress and the Atom Bomb.